Gary McDonald, chairman and CEO of Gary McDonald Homes (as well as Gary McDonald Development Company), is a well-known builder and land developer in California’s Central Valley. Born in 1943, in Lakeland, Florida, McDonald enlisted and served in the United States Navy from 1962 to 1966. The Navy brought him to Lemoore Naval Air Station located in the Central Valley of California. After being honorably discharged from the Navy in 1966, he made Fresno his permanent residence. Following the completion of college at California State University in 1970, he embarked on a 47 year career in land development, home building, and banking. Over the course of his career, McDonald’s companies have been involved in the planning, developing, designing, and building over 7,500 homes and lots, garnering a reputation for producing high-quality workmanship with an impeccable attention to detail. In 1980, McDonald was the founding Chairman of Regency Bank. Through his management, the bank’s subsidiary company, Regency Service Corporation, developed and built over 3,500 homes and lots. McDonald’s companies are also known for their successful cooperation and collaboration with other developers-builders to produce large scale communities. Two of the most prestigious developments in Fresno, in which McDonald was a principal, are the Dominion, a 500-acre planned community with over 3,000 units and 52 acres of commercial property and Copper River Ranch, a 900-acre golf course community with 3,682 residential units and 74 acres of commercial property. McDonald is currently building several gated, planned unit developments at Copper River Ranch. These homes range in price from $600,000 to $3,000,000, many of which have golf course frontage. McDonald has been an active member of the BIA of Fresno and Madera counties since 1975 and became Board Chairman in 2002. He has also served on the Boards of the National Association of Home Builders (NAHB) and the California Building Industry Association (CBIA). 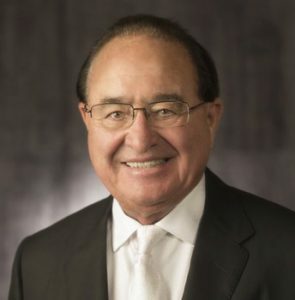 He is involved with various community organizations, such as Saint Agnes Medical Center of Fresno, California State University of Fresno’s Athletic Department, Fresno Inter-City Revitalization Committee, Pepperdine School of Law Board, California Baptist University, and Johns Hopkins Hospital, among others. Gary has been married to Beverly Nichols McDonald for 51 years. They have one daughter, Tisha McDonald, son-in-law, Chad Morgan, and grandchildren, Sloan and Kensington Morgan.